This 1599 Breeches Bible is one of the most interesting editions of the Geneva Bible, for 1599 - boldly stamped in gold on its cover – was not the date of its publication! The statement on the title page carefully elaborates further that it was Imprinted at London, by the deputies of Christopher Barker, Printer to the Queenes most excellent Majestie – 1599. But in fact the Bible was printed in Holland during the 1630s. There is a reason for the faked origin of this edition. The controversial churchman, William Laud (1573-1645), was known for his attempts to re-introduce pre-Reformation practices in England and for his antagonism towards the Puritan and Calvinist influences that lay behind the Geneva Bible. This gained him favour with King Charles 1st, who made him Archbishop of Canterbury in 1633. Laud then gave orders, forbidding the printing and importing of the censored Bible. 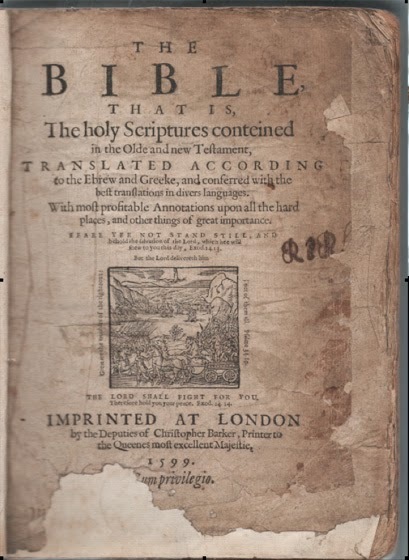 This explains the device that was then used - of importing the Bibles, but attributing them to the earlier time of Queen Elizabeth’s reign, and to Barker’s printing house in London. 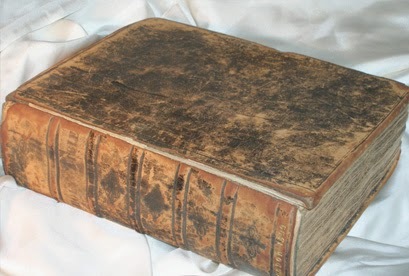 This edition – revised by Tomson, an Elizabethan civil servant – built upon the original Geneva version. The bulk of it consists of Tyndale’s latest text, revised according to Beza’s famous Greek-Latin New Testament, which came out too late for the first edition. The Bible also features a commentary on the Book of Revelation that runs alongside the text. It was contributed by the famous French scholar Francois Junius of Heidelberg and Leyden University, noted for his escapes while preaching near Antwerp around 1556. The Bible outlasted both Archbishop Laud – beheaded for treason at Tower Hill in 1645 – and King Charles 1st, himself beheaded in 1649. And the effect of this famous edition? The historian G.M. 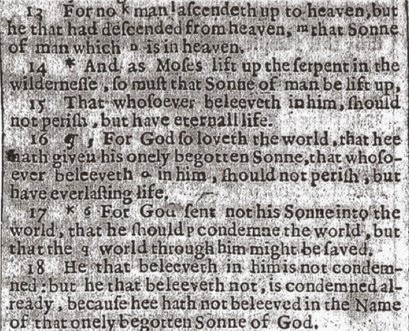 Trevellyan wrote of the seventeenth century that the effect of the study of the Bible upon the national character, imagination and intelligence for nearly three centuries to come was greater than that of any literary movement in our annals or any religious movement since the coming of St. Augustine. Whether it has been the Roman Caesars, Archbishop Laud, Mary Tudor, Voltaire, Marxism or atheists of this and every century, the final burying of the Bible has been prophesied so often as to be no longer interesting.